(Zenit.org).- High-ranking representatives of the Catholic and Russian Orthodox Churches embraced on Monday in a moment reflecting a will for unity between the two Churches. 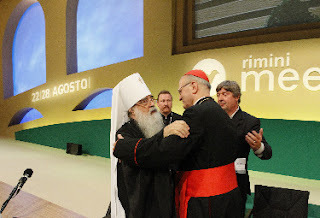 The embrace between the two high-level representatives was a highlight of the 31st Meeting for Friendship Among Peoples, an annual event sponsored by the Catholic Communion and Liberation Movement in Rimini, Italy. Cardinal Erdo is the archbishop of Esztergom-Budapest, Hungary, and the president of the Council of European Bishops’ Conferences (CCEE). Filaret is the metropolitan of Minsk and Sluzk and Patriarchal Exarch of All Belarus. The Catholic and Russian Orthodox Churches are already united in their common stance on many issues affecting Europe: challenges to life and family and religious freedom among them. Recently, an apostolic nunciature was opened in Moscow, and there is ever greater insistence on a meeting between Benedict XVI and Orthodox Patriarch Kirill of Moscow and All Russia. The cardinal and metropolitan considered the debate topic on Christ’s divinity, a theme drawn from notes of the novel “Demons” by Fyodor Dostoyevsky. It reflects a question among the European elite of the 1860s, which returns with burning timeliness. “We must pray so that the Lord will help our faith because everything is possible for one who believes,” the metropolitan concluded. For his part, Cardinal Erdo pointed to the contradictions in contemporary European intellectuals. He suggested that a “trite atheism” and the “famous historical and dialectical materialism of traditional Marxism” do not seem attractive. But, pantheism is fashionable, he proposed. “If the man of today asks himself seriously the question on the existence of God, absolute, transcendent and personal, he must investigate also the possibility of communion between God and man that took place in Jesus Christ,” the cardinal said.